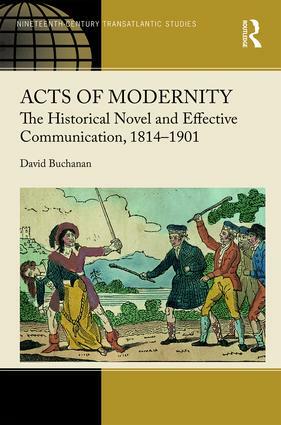 In Acts of Modernity, David Buchanan reads nineteenth-century historical novels from Scotland, America, France, and Canada as instances of modern discourse reflective of community concerns and methods that were transatlantic in scope. Following on revolutionary events at home and abroad, the unique combination of history and romance initiated by Walter Scott’s Waverley (1814) furthered interest in the transition to and depiction of the nation-state. Established and lesser-known novelists reinterpreted the genre to describe the impact of modernization and to propose coping mechanisms, according to interests and circumstances. Besides analysis of the chronotopic representation of modernity within and between national contexts, Buchanan considers how remediation enabled diverse communities to encounter popular historical novels in upmarket and downmarket forms over the course of the century. He pays attention to the way communication practices are embedded within and constitutive of the social lives of readers, and more specifically, to how cultural producers adapted the historical novel to dynamic communication situations. In these ways, Acts of Modernity investigates how the historical novel was repeatedly reinvented to effectively communicate the consequences of modernity as problem-solutions of relevance to people on both sides of the Atlantic. David Buchanan is a postdoctoral fellow in the Department of English and Film Studies at the University of Alberta, a tutor in the Centre for Humanities at Athabasca University, and a sessional instructor of English in the Department of Literature and Language at Concordia University of Edmonton. Focusing on the long nineteenth century (ca. 17501900), this series offers a forum for the publication of scholarly work investigating the literary, historical, artistic, and philosophical foundations of transatlantic culture. A vital field of interdisciplinary investigation, transatlantic scholarship contextualizes its objects of study in relation to exchanges, interactions, and negotiations that occurred between and among authors and other artists hailing from both sides of the Atlantic. As a result, transatlantic research calls into question established disciplinary boundaries that have long functioned to segregate various national or cultural literatures and art forms, challenging as well the traditional academic emphasis upon periodization and canonization. By examining representations dealing with such topics as travel and exploration, migration and diaspora, slavery, aboriginal culture, revolution, colonialism and anticolonial resistance, the series offers new insights into the hybrid or intercultural basis of transatlantic identity, politics, and aesthetics. Please note, this series is done commissioning and will no longer be taking submissions.